The Residential Energy Services Network (RESNET) was founded in 1995 as an independent, non-profit organization to help homeowners reduce the cost of their utility bills by making their homes more energy efficient. Get on Our Mailing List! Join the growing community of RESNET SmartHome homeowners and stay up-to-date with what’s happening in the world of home energy efficiency. What Is an Energy Rater/Auditor? Why Use a Qualified Contractor? 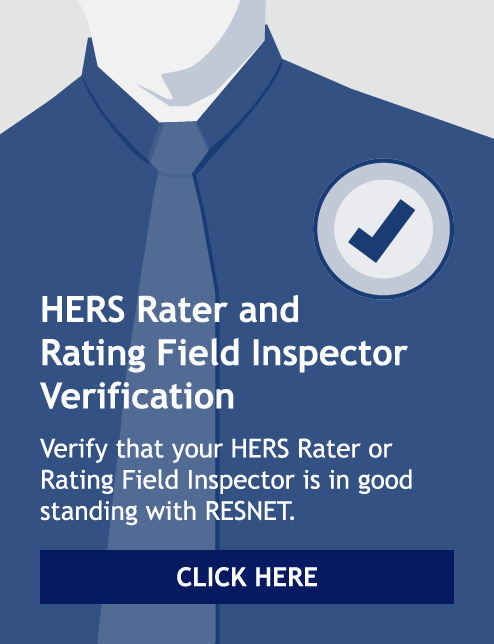 RESNET Home Energy Professional Members are highly trained and held to a higher standard. It’s expertise you can rely upon. What Is an Energy Rating? What Is an Energy Audit? A home energy audit or rating will show you where and how your home is losing energy, and provide you with cost-effective solutions to the problems. What Is an Energy Mortgage? From energy mortgages to residential energy tax credits, learn about all the financial benefits you can take advantage of when you decide to make your home more energy efficient. What Is the HERS Index? The benefits of energy efficient homes, such as lower utility costs, increased home comfort and higher resale values are already making an impact with American homeowners and buyers. And the best way to finance the purchase of an energy efficient home, or energy-saving retrofits to an existing home, is through an energy mortgage. EEMs allow homebuyers to finance and include cost effective energy saving measures as part of their mortgage. By stretching debt-to-income ratios on loans, they enable borrowers to qualify for larger loan amounts and better, more energy efficient homes. EIMs include the costs of energy efficiency improvements in the mortgage, so borrowers aren’t faced with the prospect of a larger down payment. Money that is saved in utility bills can then be used towards financing energy improvements. Most lenders offer energy mortgages, so if you’re interested in getting one, talk to your financial institution about options available to you. The Federal Housing Administration (FHA) also offers EEMs to consumers. You can contact a FHA approved lender to apply for a FHA insured EEM. Veterans can contact their local VA Regional Loan Center for information on VA EEMs. Participating lenders can offer borrowers lower mortgage rates than what they would normally get if applying for a standard home loan. Approved borrowers can also benefit from lower fees with an ENERGY STAR mortgage. Another plus point to an ENERGY STAR mortgage is that participating lenders may also provide an added financial benefit to borrowers in the form of closing cost discounts. Increase home comfort while saving energy and money when you work with a RESNET Professional Member! Find out what it is, how it works and why it's important to you. Our energy saving tips could help you save BIG money! Get all the latest news on home energy!